Encontrará la parte alta de camping en este 1973 reformado 29 'SilverStreak remolque. Todas las funciones que van a necesitar para la comodidad ... Satallite con SHO y HBO Wi-Fi y teléfono. patio cubierto, asientos cómodos e incluso una perrera para su perro. Se detalla a cabo con acentos cubanos, usted podrá disfrutar de la atmósfera de este hecho de nuevo con gusto clásico. Una gran ubicación a poca distancia del centro de San Felipe y playas de arena. Aparcamiento seguro le permite llevar sus juguetes para disfrutar del desierto y el mar. 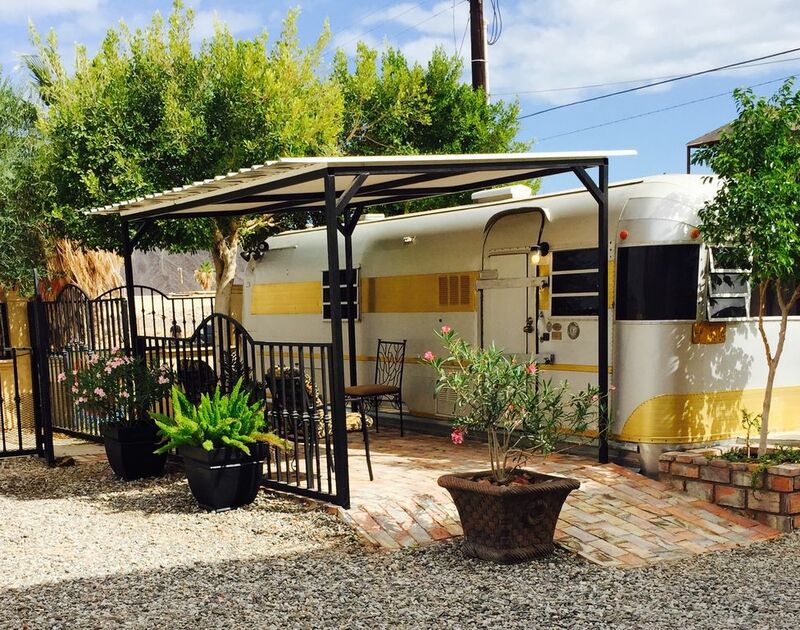 San Felipe in a vintage airstream. Absolutely Loved staying at your place for the San Felipe 250. Being able to walk down to the Malecon for the race was definitely a plus. GREAT hospitality and would also stay here again no doubt. Thank you Gail & Michael for everything . This camper is spacious, comfortable, and well equipped. The patio and compound are beautifully landscaped. Mike is a great host and even drove us around town when we arrived to show us the lay of the land and provide restaurant recommendations. Beach access is easy. Sasha, the resident dog, is a sweetheart. This is a hidden gem in San Felipe. Loved the property and the closeness to the beach and to town. Would recommend this property to anyone going to San Felipe! We stayed at Mike and Gail's for a weekend and it was all that they said it was. Mike was very generous and took us to a tour of the town and showed us all of the local hangouts. They also informed us of things to see and do around town as it was our first time there. The unit was very clean and equipped with all needed. We felt safe at all times. We would definitely rent from them again. Gail and Michael were absolutely amazing hosts! The property was perfect. We ended up staying in a bigger trailer on the same lot but all three of the airstreams/spartan were amazing. They were VERY clean and decorated with great style. Upon arrival Michael took us on a tour of the town and recommended things to do and places to eat. He even helped us rent an ATV from a friend. We could not have asked for a better experience and cannot wait to come back! Llegado de una estancia relajante en Baja Oasis del mar. Beachcomb en nuestra playa favorita a sólo 1 minuto de distancia. El malecón ofrece restaurantes, tiendas y vida nocturna y es disfrutado por todas las edades. El golf y el desierto excursiones también están disponibles!